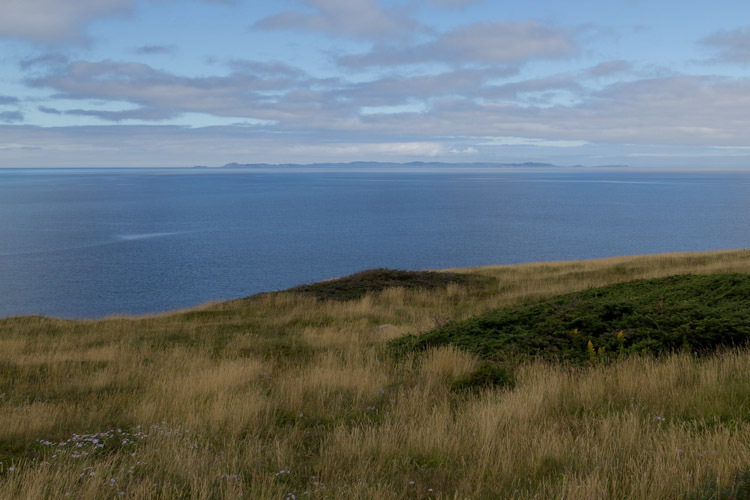 If Newfoundland and France had a baby, its name would be St. Pierre. 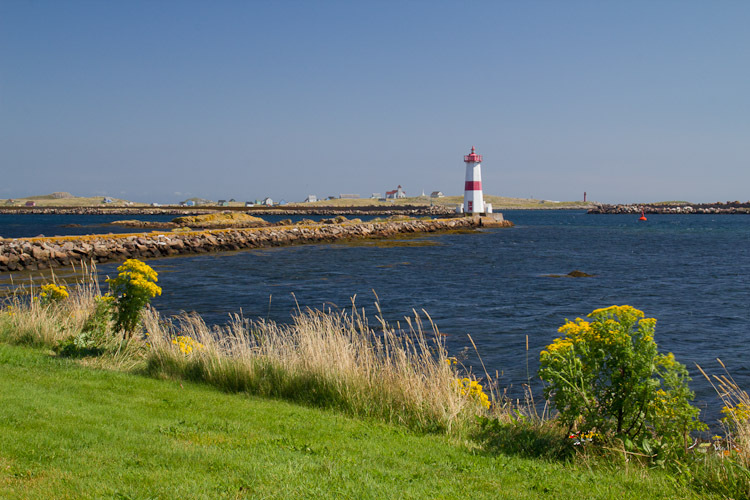 Many Canadians do not know about St. Pierre et Miquelon, a small group French islands that lie only a few kilometers from the shore of the Burin Peninsula. Nicole and I have decided to take the trip down over the fall long weekend, and Nicole has long reserved spaces for us on the ferry to St. Pierre from Fortune, NL. 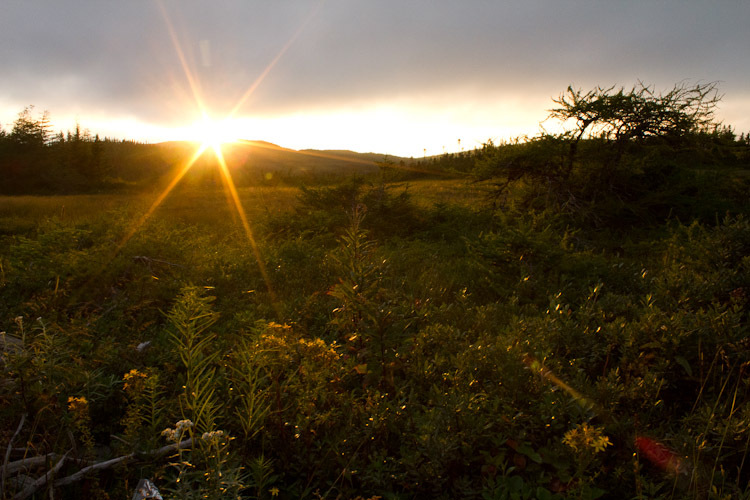 We leave immediately after work on Friday, and head straight for the Burin Peninsula. The sun is setting quickly as we drive, the mountainous terrain casting a beautiful silhouette. We're only a few kilometers south of the TCH when we stop to take this photo. A short distance further down the road, we find a perfect little spot along the side of the road to set up our tent and camp for the night. 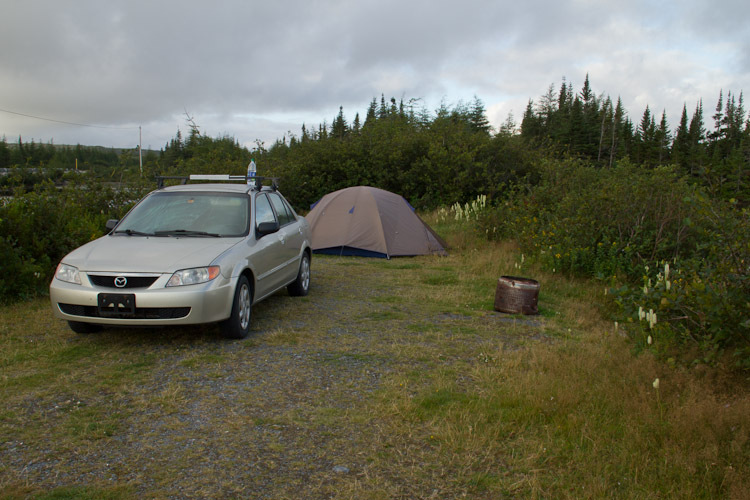 One of my favourite things about Newfoundland is how one can camp pretty much anywhere. There's so much space here that it's rare for anyone to even notice your presence, let alone be bothered much by your presence. I snapped this shot of our side-of-the-road campsite in the morning. We're not taking the ferry across until Sunday, which leaves us an entire day to explore the Burin Peninsula. We drive through numerous small towns, enjoying the scenary despite the fog. By the time we reach Fortune Head the sun burns off the fog, and we're treated with beautiful view of some islands across the bay. The Burin wasn't really the focus of our trip when we set out, but I'm glad we've left ourselves enough time to explore it. 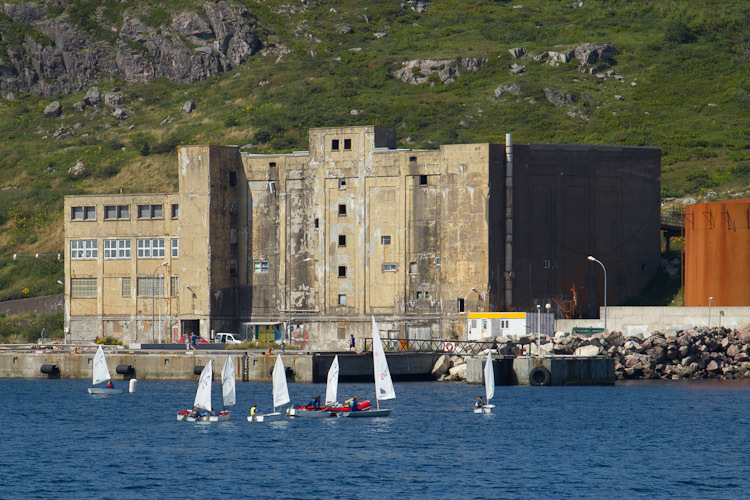 It is a series of beautiful views, interspersed with small picturesque fishing villages. We camp the night at Frenchman's Cove, which turns out to be one of the best campgrounds we've been to yet in Newfoundland. Everyone there was really friendly and the scenary was beautiful. The beach there is on a freshwater lake, but it has a narrow connection to the ocean, so the water is just a little salty. 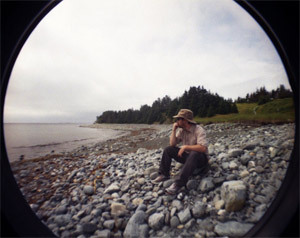 In the evening, we walk along the rocky beach on the ocean side of freshman's cove. 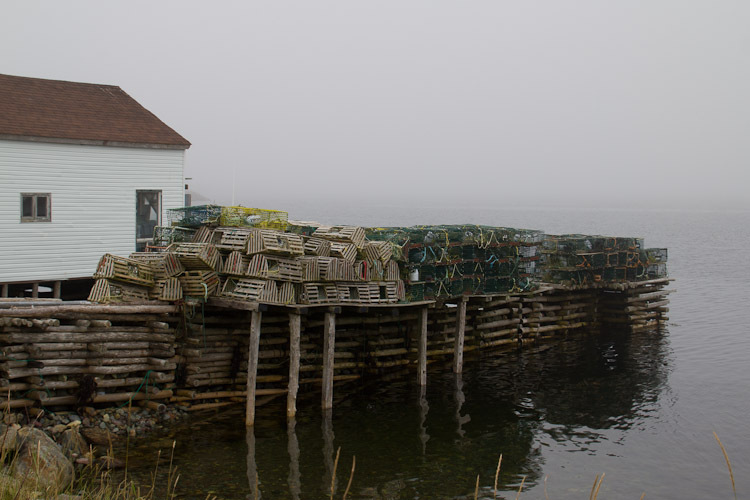 We make our way out to a point where several fishing huts and docks are. I experiment with my ND Fader and the tripod I've borrowed from work as the sunset intensifies, eventually snapping this little gem. It's getting dark when we get back, and the campground is abuzz with activity. Gangs of children scurry about, armed with flashlights and glow sticks. They play games of manhunt and flashlight tag while the adults cook dinner and whet their whistles. 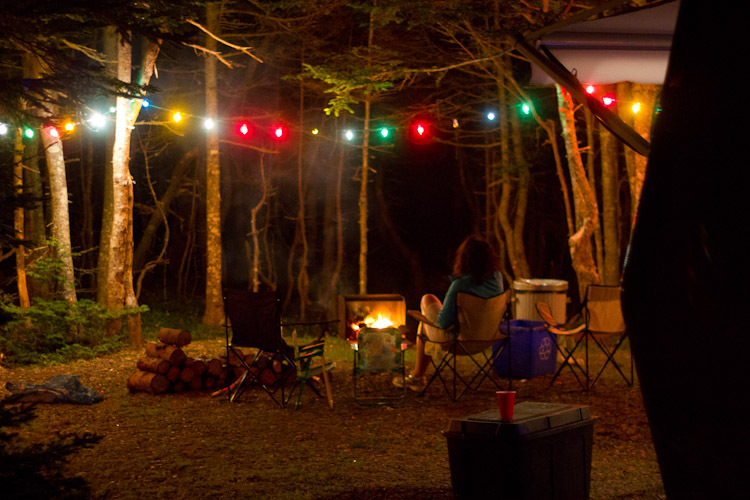 Christmas lights are strung up around most of the campsites, which typically consist of a large truck towing an RV, and numerous camp chairs around a campfire. The mood reminds me of the many summer nights I spent growing up with my cousins. We would be left to run free (within our prescribed boundaries), especially up at Brian and Joan's cottage near Bancroft, ON. It's such a contrast to urban life, where parents are always on guard, defending their children from would-be kidnappers. I feel bad for kids who miss out on an experience like this. The next day we board the ferry and head to St. Pierre. We see a few whales off in the distance during the 1.5 hour trip, and manage to hold our breakfast down despite some reasonably large swells. When we arrive, it appears as though our ferry has crashed the party - a sailing competition is going on near the entrance to the harbour, and they seem unimpressed by the waves our much larger vessel creates. At least it made for a nice photo. After disembarking, it's immediately apparent that St. Pierre is not just French in title and ownership. Things are different here. The signs are different, the architecture is different, and (of course) the language is different. After dropping our bags off at the Hotel Robert, where we'll be staying the night, we wander around town in search of pastries and something tasty for dinner. It doesn't take long for us to find a tasty croissant and a few buttery pastries to munch on. We wander further along the shore, taking pictures of the bizarre Newfoundland-influenced, yet still somehow French, architecture. 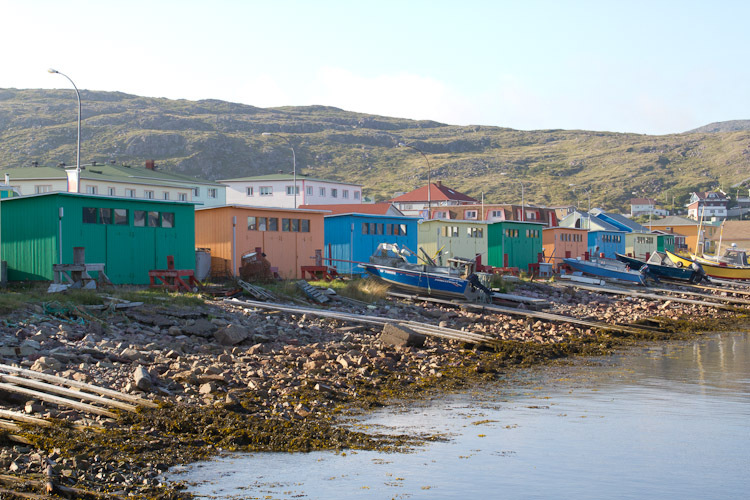 The best example of this fusion of cultures seems to be to the colourful fishing shacks which line the short just north of downtown. We find an excellent little pizza restaurant that has been recommended to us (with good reason) and have a nice dinner. 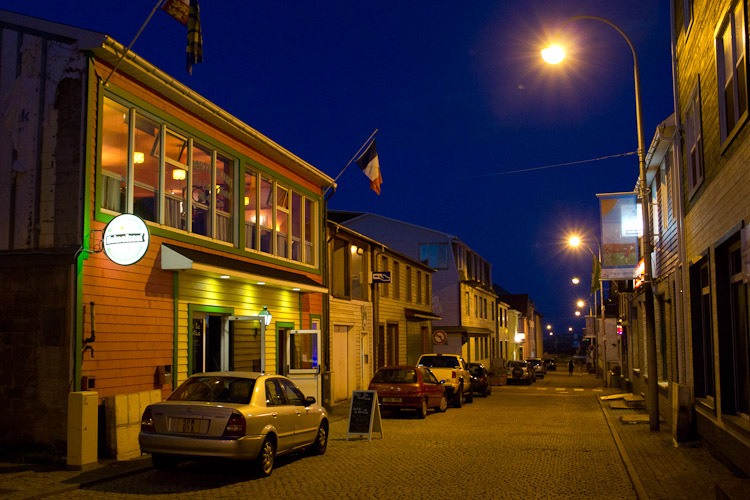 After dinner, we wander the streets and pop in to a couple of the local watering holes. Unfortunately, the discotheque is completely dead. I'm sure on another night it would resemble the cheesy dance bars of St. Catherine street in Montreal, but tonight there is only one person sitting at the bar and the bartender hasn't even bothered to turn on music. Darn! I was ready to shamelessly bust a move to some annoying euro-techno. So instead we head to Bar Barati for a couple more euro-sized bottles of Kronenbourg. After a couple somewhat laboured attempts at conversations with the locals, we eventually retire to the hotel. We spend the next day wandering around the streets, hardly able to believe the luck we've had with the weather. We visit various stores to gawk at any strange imported-from-France items we don't recognize, and continue to take pictures of the picturesque town. We see whales again on the ferry trip home, and the 4 hour drive back to St. John's passes fairly uneventfully. 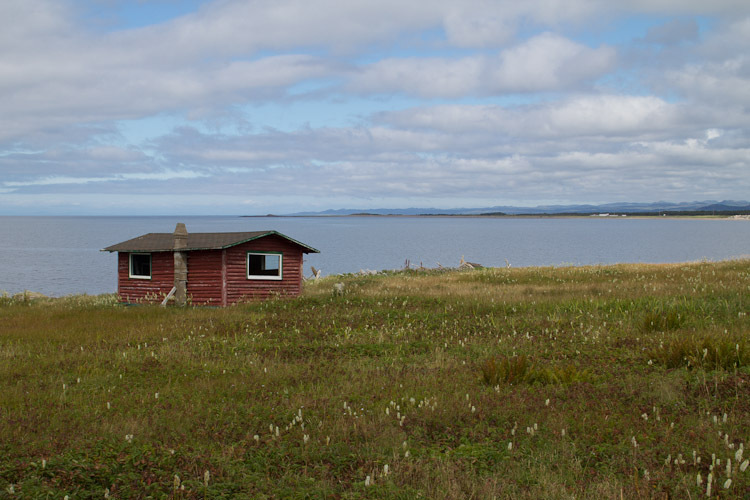 Nicole and I reflect on the fact that while St. Pierre was a beautiful and interesting place to visit, it would probably be a tough and isolating place to live. 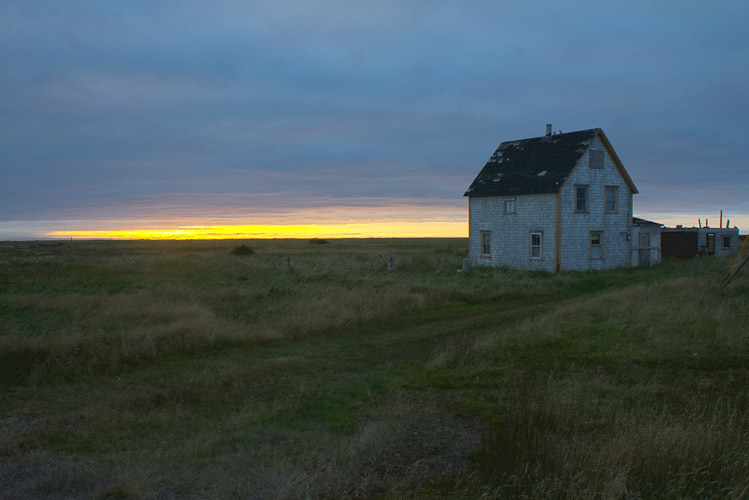 My St. Pierre and The Burin gallery has the rest of the pictures from our trip.